Since the shocking finale of Secret Invasion vaulted him to national prominence and a newfound respect, Norman Osborn slowly organized his power base, promoting his minions, eliminating his enemies- and losing his sanity. 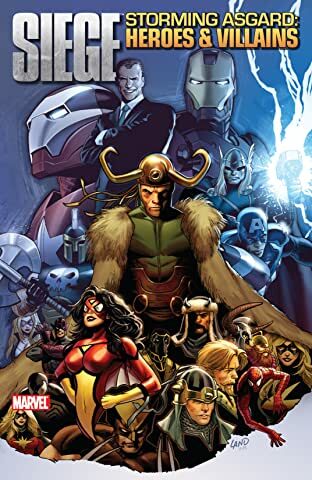 Now, as he meets with the uber-powerful elite of the Cabal- Doctor Doom, Loki and the Hood- the final stages of his Dark Reign are about to be put into fruition: the taking of Asgard. Some might say such a plan is insane. And when you're dealing with the former and possibly future Green Goblin, we're not going to necessarily disagree with you! 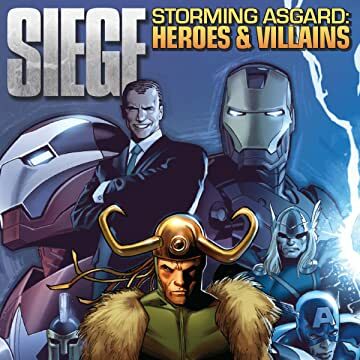 Siege: Storming Asgard – Heroes & Villains takes you inside the careful planning behind Osborn's crusade to take the kingdom of Thor off the board. Who are the featured players in the saga, how did we get here, and what are the many contingencies in this operation? With insider character bios and commentary from the creators behind the Dark Siege, this will make essential reading for understanding the event inside and out!